Decent housing should be an absolute right for all people. But, we continue to live in a world that homelessness, evictions of the poor, and degrading housing conditions are all too common. At the same time, we see abandoned housing left to rot. This should convince us that our housing problems come not from a lack of resources, but from a poor distribution of those resources. As is the problem with so many facets of our lives, housing is organized for private profit and not for people’s common needs. The only way for us to change these problems is to organize together and demand it. But, who do we organize and how? And, who is the enemy? For most working class people, owning our home isn’t a possibility and we’re often forced into a housing market with large landlords. Just as often, the tenants and the landlords have conflicting sets of interests. While we’re simply trying to hold onto a basic necessity of life, landlords hope to gain a profit from us. Sadly, the interests of the landlords are usually dominant, thanks to a system of legal and government support rarely enjoyed by tenants. Not all working class people are renters and many in poor cities, have managed to buy their own home. While at times, we may rent out a room or floor of our house, we generally have more in common with tenants than the large landlords. Homeowners are very often tenants themselves of the largest of landlords – the banks. Even if the mortgage has been paid, working class homeowners occupy a very small and isolated part of the housing market, where much larger landlords have real control. These homeowners may be in a more comfortable immediate position. But, they’re also in a very precarious situation and could easily lose their home in any number of ways. On the other hand large landlords own apartment buildings or dozens of houses throughout the city. They use our basic need for housing as a tool to create profits, often massive, for themselves. Their interest is to make the greatest possible profit for themselves. That means keeping repairs to a minimum and charging as much rent as they believe they can. Having little power individually, renters are often on the losing end of this conflict. Homelessness, evictions, and poor living standards are clear signs of our current weak position. The beauty of our situation, is that collectively we have far greater power than our landlords. Our rent is the source of their wealth. For them to continue their life of luxury without work they need us to continue living in their apartments, continue paying their rent, and keep accepting the living conditions that they choose for us. Our landlords are absolutely reliant upon us. They rely on the hope that we will never understand our true strength. The power of the working class has the same limits in the struggle for decent and affordable housing as it does in the workplace – it’s collective. When we struggle alone in isolation the landlord has nearly absolute power. Our power is only real power when we get together with others in similar situations and organize for justice. Public Pressure: Through rallies, media events, and public meetings we can hurt the image of our landlords. A bad public image can hurt their ability to find new renters and force public demand for investigations of the conditions in their properties. Eviction Blockades: In the case that any of the members of the tenants’ union are being unjustly evicted or evicted in retaliation for their organizing efforts, other members of the union should organize a blockade of that member’s house or apartment. With the tenants’ union, the normally disempowering experience of being evicted becomes a show of the power of solidarity. The act that we usually suffer in isolation becomes a moment of true community as serious attention is brought to the eviction. Direct Action: In the case that our organized public pressure doesn’t solve the problems that we are having with our landlords, we could target them more aggressively by actively disrupting their ability to continue business. Occupation of company offices and disrupting the visits of new tenants are a couple of possibilities that may force our landlords to listen our demands. Rent Strike: The greatest source of our power with landlords is actually one of the easiest for us to use. A collective refusal to pay rent until demands are met should bring even the most abusive landlords to the table. If an individual were to refuse to pay rent, the landlord would have an easy time fighting back. But when all of their tenants refuse to pay rent, they quickly find themselves outmatched. Solidarity: An injury to one is an injury to all. When we begin to fight our landlords, we have to know that we aren’t doing so alone, and this is the purpose of our union. Having a Tenant Union would mean that none of us struggle in isolation. Just because one group of tenants has won a fight against their landlord doesn’t mean that they are no longer part of the struggle. They will provide resources, experience, and volunteers to the effort of organizing other renters throughout the city. In the struggle against our landlords, there is one important realization. Our landlords don’t do anything for us that we aren’t capable of doing for ourselves. We are more than capable of organizing ourselves to make repairs and maintain the buildings where we live. There are cooperative housing associations throughout the world that show us proof of our ability to live without landlords. So, if we can organize ourselves to maintain our housing needs, what do landlords do? That is exactly the point. Landlords exist purely to take rent from us. As we develop true power as renters, we will realize that the real battle is for a system of housing that recognizes our right to decent, affordable place to live no matter what. This means getting rid of a world of for-profit housing. No one should exploit a system of vulgar inequality to create massive profits from our need to survive. We know that these inequalities will only exist as long as we permit them. 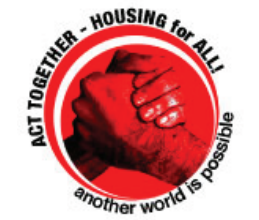 So let’s begin the struggle for just housing today! AN interesting article, a lot of the time landlords like local councils or housing associations are quite conjoined so the possibility of collective struggle is present - and rent strikes ARE effective. The 'faire rents act' is supposed to slowly creep up rents and service charges but they should be fought when they first rear their ugly heads (this is similar in the US and UK I believe). give me a zip code and ill get you a list of properties in foreclosure there. Thanks for putting this up. I wanted to read more about the Buffalo tenant organizing.